Mountain View, CA. Concert Tickets on Sale May 3! After many months of waiting, tickets for the Choir and Orchestra’s 2018 Classic Coast Tour performance on Monday, June 25, at the Shoreline Amphitheatre in Mountain View, California, will go on sale on Thursday, May 3. The Shoreline Amphitheatre is an outdoor performing arts venue in the San Francisco Bay area that regularly hosts classical and contemporary artists. It is a highly sought after musical venue for concerts under the stars in the California summer. “Come, Thou Fount of Every Blessing” Passes 5 Million Views! “Come, Thou Fount of Every Blessing” was one of the very first songs uploaded to the Mormon Tabernacle Choir’s YouTube channel when the channel was launched in 2012, and now it has officially surpassed 5 million views. Cinderella on stage in the Conference Center with the Mormon Tabernacle Choir and Orchestra at Temple Square! It doesn’t get better than this. Saratoga Springs—a huge success, even at sound check! Duke Devlin has been at Bethel Woods since the Woodstock festival in 1969. The two share the same farmer’s fields. He was 26 when he hitchhiked with a friend from Texas to attend the three-day festival with 500,000 of his “friends.” He planted his feet in the small farming community of New York and never left. He married, raised a family and today, at 72 with a flowing beard, he acts as the site interpreter for Bethel Woods sharing his personal experience at Woodstock. The field sits just next door to the sprawling outdoor amphitheater. Twelve days on tour and the Choir is still singing. Choir members don’t get much of a break when they get home with Tuesday and Thursday rehearsals, Sunday morning Music and the Spoken Word broadcast and then the Pioneer Concert featuring award-winning Broadway star Laura Osnes. The concert, “Music for a Summer Evening” is July 17 and 18 at 8 p.m. at the Conference Center in downtown Salt Lake City. As July 4th as it gets! Flags flying. Cannons blasting. Cadets marching. Fireworks. Drums and bugles, a crowd of more than 12,000. And the Mormon Tabernacle Choir. The Choir’s concert July 4, 2015 was an extravaganza of sounds and sights “Under the Stars” at the United States Military Academy best known as West Point. The Citi Wang Theatre in Boston is celebrating its 90th anniversary this year, and the Mormon Tabernacle Choir is fortunate enough to be on its program of scheduled performers. This week Alex Boyé has been sharing the stage with the “America’s Choir” on the Atlantic Coast Tour. He even excited the Choir on the airplane, leading Choir members in an in-flight sing-along. Watch the video here. Last week Boyé was watched on millions of television screens across the Unites States when he and his band amazed the audience and judges with a rousing rendition of “Shake it Off” by Taylor Swift. Applications to join the Mormon Tabernacle Choir open July 1 and close August 15. The Choir leadership will be auditioning for all positions. As chairman of the General Church Music Committee, Leroy Robertson was always looking for good music for the youth of The Church of Jesus Christ of Latter-day Saints. While serving in this position he wrote, “On This Day of Joy and Gladness” for the youth choruses that were being encouraged in the Church at the time. Imagine yourself walking down the street in New York City with the usual sights, smells, and sounds, when suddenly someone in a maroon dress walks by. No big deal because if you’ve spent any time in the City, you’ve seen pretty much everything. Suddenly another person and another and another walk by with the same dress. Now you’re also seeing men in black suits and bow ties, followed by men and women dressed in black carrying instruments. “What’s going on?” you ask. The Mormon Tabernacle Choir’s final stop on this summer’s tour was in Boston, Massachusetts, at the prestigious Wang Theatre. During the soundcheck, Danielle Tumminio was able to sing with the Choir’s soprano section. Tumminio is an Episcopal priest and a three-time graduate from Yale University. She holds a doctorate in practical theology from Boston University, has taught at Yale and Tufts, and is currently chaplain at the Groton School. In her own words, her original intent for being there was to “describe what it was like to perform with such an elite group.” She ended up getting more out of the experience than she expected. During the Choir’s Atlantic Coast Tour in the summer of 2015, we caught up with Alex Boyé in Boston before the tour’s final show. Boyé was on tour as the Choir’s guest soloist and performed the spirituals “I Want Jesus to Walk with Me” and “I’m Runnin’ On.” At the time of our interview, he was fresh off the stage from sound check and excited about his America’s Got Talent television audition performance that was making its way around the Internet and being shared by celebrities. Our 2015 Pioneer Day concert guest artist—talented Broadway leading lady Laura Osnes—sat down with us for a post-concert interview and discussed her relationship with her husband and how her Christian faith keeps her grounded. Elder Richard G. Scott, tenderhearted member of the Quorum of the Twelve Apostles since 1988 and dear friend of the Mormon Tabernacle Choir, died Tuesday, September 22, 2015. Elder Scott will be remembered and revered by Choir members for his support and encouragement. Latter-day Saints travel from all over the world to attend the semiannual general conference of The Church of Jesus Christ of Latter-day Saints in the Conference Center in Salt Lake City, and the Mormon Tabernacle Choir has been providing music for the conferences since 1867. The Choir will sing at the Saturday morning, Sunday morning, and Sunday afternoon sessions of the October 2015 General Conference. Music selections are drawn from the hymns of the Church and other music rich with traditional meaning for Church members. A special selection is often chosen to appeal to the children of the Church. You can find veiwing information at www.lds.org. Get ready for the biggest release of 2015! The Mormon Tabernacle Choir and Orchestra at Temple Square are joined by The Muppets® from Sesame Street® and Frozen’s Prince Hans, Santino Fontana, for Keep Christmas with You. Three more days! Get ready for the biggest release of 2015! The Mormon Tabernacle Choir and Orchestra at Temple Square are joined by The Muppets® from Sesame Street® and Frozen’s Prince Hans, Santino Fontana, for Keep Christmas with You. Four more days! Get ready for the biggest release of 2015! The Mormon Tabernacle Choir and Orchestra at Temple Square are joined by The Muppets® from Sesame Street® and Frozen’s Prince Hans, Santino Fontana, for Keep Christmas with You. Two more days! Get ready for the biggest release of 2015! The Mormon Tabernacle Choir and Orchestra at Temple Square are joined by The Muppets® from Sesame Street® and Frozen’s Prince Hans, Santino Fontana, for Keep Christmas with You. You’ve seen their videos, now see them live! The Piano Guys—famous for their state-of-the-art videos, which have amassed over 700 million views—will participate in a live, worldwide chat. Previous Face to Face events have included conversations with David Archuleta, Lindsey Stirling, and Elder David A. Bednar and his wife, Susan. The moment is here! This year’s Christmas concert guest artists are guaranteed to bring a smile to your face. We have not two, but six guest artists who will make the Christmas concert something never to be forgotten. One more day! Get ready for the biggest release of 2015! The Mormon Tabernacle Choir and Orchestra at Temple Square are joined by The Muppets® from Sesame Street® and Frozen’s Prince Hans, Santino Fontana, for Keep Christmas with You. Longtime friend and former Music and the Spoken Word announcer J. Spencer Kinard has retired after 32 years of service with the Mormon Tabernacle Choir organization. Kinard has served as a Sunday morning host since the concept of having a host address the audience was inaugurated in the fall of 2002. Kinard, Duane Cardall, Mark Eubank, and Kent Norton were the initial four hosts and Ruth Todd has also served as a host. With Kinard’s departure to serve an LDS mission with his wife in Washington, DC, an interesting new hosting arrangement will be made to fill his shoes. Watch for a future blog with this announcement. Many people grew up watching Sesame Street, but how many can say they made friends with the characters? Santino Fontana can! Christmas may belong to December but who doesn’t love the songs and celebrations all year long! The newest CD and DVD release from the Mormon Tabernacle Choir and Orchestra at Temple Square—Keep Christmas with You—is filled with the magic and joy of the season. And its star-studded cast is one you will love to watch again: Broadway leading man Santino Fontana, Elmo, Big Bird, Cookie Monster, and their friends from Sesame Street®, over 100 dancers, the Bells on Temple Square, the Orchestra at Temple Square and of course, the Choir. Now you can literally keep Christmas with you all through the year—and beyond. The full HD recording of the 2014 concert Keep Christmas With You, featuring Santino Fontana and the the Muppets® from Sesame Street®, is now available on iTunes digital download. You might be surprised to know that the Mormon Tabernacle Choir rehearses only twice a week—Thursday nights and Sunday mornings before the weekly broadcast of Music and the Spoken Word. Because of the limited rehearsal time, the Choir’s music director, Mack Wilberg, has to maximize each rehearsal, making sure to get each phrase and note correct. This year’s Mormon Tabernacle Choir Christmas concerts are packed with talented performers, including returning Pioneer Day concert guest Laura Osnes, four Metropolitan Opera soloists, and British actor Martin Jarvis. Jarvis will serve as the narrator for the concerts and boasts a large resume full of roles you might recognize from every facet of performing arts. Let’s take a closer look at Martin Jarvis. 4,500 Broadcasts! No One Else Has Such a Record! Undoubtedly, there is no broadcast that has touched the lives of so many for so long as has the weekly program Music and the Spoken Word. The December 13 program will be the 4,500th broadcast. What a run! And the program is still continuing its run of uninterrupted broadcasting, adding listeners and viewers in scores of countries around the world! It’s the longest continuous running weekly broadcast anywhere—and rightly so. Where else can you hear such glorious music coupled with a brief, compelling message of inspiration? When guest artists come to sing with the Mormon Tabernacle Choir and Orchestra at Temple Square, their schedules are tight and focused. Often, the only time fans get a glimpse of the artist's personality is during the Friday morning press conference and the few moments on stage between songs. When guest artists come to perform with the Mormon Tabernacle Choir and Orchestra at Temple Square, their schedules are tight and focused. Often, the only time fans get a glimpse of the artist's personality is during the Friday morning press conference and the few moments on stage between songs or narrations. Lloyd Newell Has Been at the Microphone for 25 Years! Nearly every week for the past 25 years, Lloyd Newell has stood at the microphone and presented a message of inspiration to people in all corners of the world. The announcer for Music and the Spoken Word, the longest continuously running weekly network program in broadcast history, Newell welcomes listeners and viewers to the half-hour program as well as sharing a message—one that he usually writes himself. The broadcast is a gift to people everywhere. The messages are filled with hope, universal principles, and good news. Newell reads all the time looking for stories, examples, hints, and commentary that will appeal to listeners and help them. A former news anchor for CNN and WSEE-TV in Pennsylvania, Newell started out with the Choir broadcast as the interim announcer. After months of filling in, he was asked by LDS Church President Gordon B. Hinckley to serve on a permanent basis. November 29 marked 25 years serving in a position Newell never imagined would last a quarter of a century. Newell, who is a volunteer in his post, as are the Choir members, is a professor at Brigham Young University. It’s his day job, but his heart is with the Choir. He tours with the Choir as well as serving as the announcer for the broadcast. He usually meets six weeks in advance with Mack Wilberg, music director of the Mormon Tabernacle Choir, to correlate the message of the Spoken Word with the music. Sometimes there is an obvious connection with the music; sometimes not. Whichever way it comes together, the program’s seamless presentation lifts the spirits of all who are listening. Last week’s Choir Notes looked back at the mountains the Mormon Tabernacle Choir organization climbed in 2015. Now to the mountains of 2016. In the spring of 2016 the first feature-length movie ever to feature the Mormon Tabernacle Choir will be released in theaters. The movie, Singing With Angels, is produced by Candlelight Media and is inspired by true events. The film follows the journey of a woman who dreams of joining the 360-member Mormon Tabernacle Choir and draws strength from it through life's challenges. There it was on television screens across America—an image of Mack Wilberg holding the baton and conducting the Mormon Tabernacle Choir and Orchestra at Temple Square performing “Hallelujah” from Handel’s Messiah. But something was different: this wasn’t a Music and the Spoken Word broadcast or a concert rerun on BYUtv—this was on ESPN. Yes, that ESPN. Where Does the Saying “Pull Out All the Stops” Come From? You may have heard of a tabernacle of clay, but chances are you’ve never heard of a tabernacle of gingerbread…until now, that is. Mormon Tabernacle Choir member Gregory Marsh spent three weeks constructing the replica, which measures 25" x 16" and stands 9 inches tall. Join Us for “An Evening of Brahms” Spring Concert! On Friday and Saturday, April 20-21, 2018, the Temple Square Chorale and Orchestra at Temple Square will join their musical talents for this year’s Spring Concert in the Salt Lake Tabernacle. What 2014 Mormon Tabernacle Choir concert sold out in seven minutes? What 1959 Choir recording was one of the most successful classical recordings of its time and became a benchmark for classical musical recordings? The answer to both questions is Handel’s Messiah. This musical masterpiece by George Frideric Handel, first performed in the spring of 1742, has become one of the world’s most beloved musical works. As a fan of the Mormon Tabernacle Choir, you would expect to hear them sing during general conference, Music and the Spoken Word broadcasts, Christmas, and Pioneer Day concerts. Where you might not expect to hear them sing are a prison, Las Vegas, A Christmas Story (the movie), Disney World, and Colonial Williamsburg, Virginia. How do you say goodbye to a good friend? Clay Christiansen, a Tabernacle organist for nearly 36 years, recently announced he will retire from his full-time position at the end of April 2018. On Sunday, April 1, after playing the organ during Sunday morning’s Music and the Spoken Word broadcast and the general conference session, Clay Christiansen received a standing ovation from the Choir and others in the Conference Center. Christiansen acknowledged the applause by raising his arms in gratitutde and nodding a silent “thank you,” first to the Choir and then to the audience. As if singing with the Mormon Tabernacle Choir wasn’t enough, there are now more reasons to join this historic gathering of voices—some famous names are submitting their videos to be a part of the Choir’s epic virtual chorus, set to the music of the “Hallelujah” chorus from Handel’s masterpiece, Messiah. Can we get a “Hallelujah?” Better yet, can we get a few thousand? We are looking for singers of all skill levels to join the world’s largest “Hallelujah” chorus, and that means you, your friends, your grandparents, or your choir. YouTube star Peter Hollens and his wife, Evynne, have teamed up with us to record videos for four individual singing parts (soprano, alto, tenor, bass). Submitted videos will then be used to make a grand virtual choir of epic proportions. Just 29 days after the first pioneers arrived in the Salt Lake Valley, a small choir was formed under the direction of Brigham Young. From this humble beginning arose what is known today as the Mormon Tabernacle Choir. For over 150 years the Choir has been lifting spirits and touching hearts through the power of music. They have sung in over 4,500 broadcasts and toured the world, and they continue to reach international audiences through social media. “By small and simple things are great things brought to pass” (Alma 37:6). In 2015, Broadway leading lady Laura Osnes graced the Conference Center stage for the Mormon Tabernacle Choir’s annual Pioneer Day concerts. The overwhelmingly positive response to her performance led to her return a mere five months later for the Christmas concerts. The concerts also featured British actor Martin Jarvis as the narrator and four Metropolitan Opera soloists. On March 12, 1987, Les Misérables opened on Broadway and quickly became a smash hit. The original Broadway production was nominated for 12 Tony Awards, winning in eight categories including Best Musical, Best Scenic Design, and Best Original Score. “Hallelujah” Virtual Choir video now available online! Messiah Concert Tickets Gone in 10 Minutes! The hottest tickets in town were claimed faster than you can say “Halleluj…. !” Gone—just like that! “Music is the universal language of mankind,” Henry Wadsworth Longfellow wrote. The truth of his statement was evident during and after the Sunday, March 20, 2016 broadcast of Music and the Spoken Word. Music and the Spoken Word in over 50 languages! For more than 86 years, nearly the lifetime of radio, the Mormon Tabernacle Choir has presented a weekly program, Music and the Spoken Word, which provides music and messages of peace, love, hope, and inspiration to audiences around the world. This past Sunday, March 27, the Choir marked their 4,515th broadcast, an achievement unsurpassed by any other program. Nearly every week for the past 25 years, Lloyd Newell has stood at the microphone in the Salt Lake Tabernacle and presented a message of inspiration to people in all parts of the world. As the announcer for Music and the Spoken Word, the longest continuously running network broadcast, Newell welcomes listeners and viewers to the half-hour program as well as sharing a message he most often writes himself. When the Beach Boys wrote the song “Good Vibrations,” they probably never imagined it would someday be performed with handbells in the Salt Lake Tabernacle—yet the Bells on Temple Square have turned that unimagined possibility into a reality with their latest video. Random Acts is a new heartwarming hidden-camera show that centers around doing good things for others in unexpected ways and will inspire viewers to pay it forward. The show airs Mondays at 8:30 p.m. mountain time on BYUtv, and episodes can be viewed on randomactstv.com after they air. “Danny Boy” is a popular ballad that was written in 1910. Many people associate the song with Ireland, even though lyricist Frederic Weatherly was a British lawyer. The connection came when his Irish-born sister-in-law sent him a copy of the tune “Londonderry Air” in 1913. Upon receiving it, Weatherly modified his lyrics to fit the meter of the tune. Craig Jessop has a long history with the Mormon Tabernacle Choir, beginning with his days as a Choir member from 1973 to 1977. He then returned as associate music director from 1995 to 1999, when he became the music director—a position he maintained until 2008. Have you ever pictured yourself in the Mormon Tabernacle Choir? Have you said to yourself, “Someday I’ll have the courage to try out” or “In a few more years I’ll have less going on in my life?” Now is the perfect time to audition—the Choir is reaching younger audiences across the globe in new and exciting ways. If you have never watched a Music and the Spoken Word broadcast live streamed over the Internet, here’s an opportunity for you! Each Sunday at 9:30 a.m. Mountain Time, the home page of mormontabernaclechoir.org connects followers to the live broadcast as it is performed in the Tabernacle on Temple Square in the Salt Lake City, Utah. Or you can use this link and go directly to the “Watch Music and the Spoken Word Live” web page. Join the broadcast using your computer, phone, or other Internet-connected mobile devices. During the Atlantic Coast tour in the summer of 2015, a KSL-TV camera crew followed the Choir’s every move. The KSL team, led by Ken Fall and Candice Madsen, filmed interviews, concert footage, behind-the-scenes footage, and all things Choir tour-related. Their work did not go unnoticed—“The Dream Tour: Behind the Scenes with the Mormon Tabernacle Choir” was just given a Gabriel Award for excellence in the Arts, National or Local Release Category. If you are looking for excuses to join your school or church choir or even the Mormon Tabernacle Choir (audition information here), here is some great scientific backup to keep your inner choir light burning. This year’s Pioneer Day concert guests are one of the Choir’s most popular guest artists, having performed in the 2007 Christmas concerts, four Cultural Olympiad concerts held in the Tabernacle during the 2002 Winter Olympic Games, and numerous Music and the Spoken Word appearances. We are pleased to announce the King’s Singers as our special guests. Twelve days into their tour of Europe, the Mormon Tabernacle Choir and Orchestra at Temple Square gave their fifth concert in Frankfurt, Germany on Saturday, July 9, 2016, at the Jahrhunderthalle (“One Hundredth Anniversary Hall”) with yet another standing ovation from an enthusiastic audience. At each European concert the Choir has engaged audiences with its vast and varied repertoire sung entirely from memory and in different languages. The Mormon Tabernacle Choir and Orchestra at Temple Square wrapped up their first European Tour in almost 20 years with sold out concerts and standing ovations from enthusiastic audiences. The Choir and Orchestra gave performances in Berlin, Nuremberg, and Frankfurt, Germany; Vienna, Austria; Zurich, Switzerland; Brussels, Belgium; and Rotterdam, The Netherlands. For 20 days, beginning June 27, the Choir and Orchestra members–all volunteers–gave up their summer vacations, left loved ones to share their music with European audiences. The Mormon Tabernacle Choir and Orchestra at Temple Square performed the last concert of their 2016 European tour in Rotterdam, Netherlands, at De Doelen concert hall. The hall was originally built in 1934 but was destroyed in 1940 by the German bombardment of Rotterdam at the beginning of World War II. De Doelen was rebuilt in 1966, and additional halls were added in the 1990s. On August 28, 2016, Jenny Oaks Baker, a Grammy Award-nominated, Billboard Magazine No. 1 violin recording artist and performer, will be a special guest on Music and the Spoken Word. Former Choir guest artist Lindsey Stirling is flying high with her new song “Something Wild,” from the Disney movie Pete’s Dragon. “Something Wild” is a collaboration between Stirling and singer Andrew McMahon and already has 5 million video views on YouTube. Pete’s Dragon entered the box office charts at #3 and remains in the top ten after its third week in theaters. Why Was “Come, Thou Fount of Every Blessing” Not Included in the Current Hymnbook? This year’s Pioneer Day guests, the King’s Singers, are longtime friends of the Mormon Tabernacle Choir and have been coming to perform with them in Salt Lake City for over 20 years. The musical camaraderie between the two groups is second to none, which makes Saturday night’s touching tribute all the more bittersweet. When the Mormon Tabernacle Choir and Orchestra at Temple Square toured Europe in the summer of 2016, fans were ecstatic. It had been 18 long years since the Choir has been to Europe—The tour visited eight European cities over 20 days and included performances in Berlin, Nuremberg and Frankfurt, Germany, Vienna, Austria, Zurich, Switzerland, Brussels, Belgium, and Rotterdam, Netherlands. Choir fans came from far and wide to see them. Most people who have experienced the music of the Mormon Tabernacle Choir have experienced it through a television, tablet, phone, or computer screen. While all of those are great options to watch the Choir’s weekly Music and the Spoken Word broadcasts or YouTube channel, there is an even better option to experience the fullness of the Choir’s wall of sound—and that is to see a live concert. Jenny Oaks Baker returned as the Mormon Tabernacle Choir’s guest artist on Music and the Spoken Word for the August 28, 2016, broadcast. During the show Baker performed "I Know That My Redeemer Lives" and "Star of Bethlehem" from Ben-Hur. We are excited to announce acclaimed tenor and entertainer Rolando Villazón as the 2016 Christmas concert guest artist. The concerts, featuring the Mormon Tabernacle Choir, Orchestra at Temple Square, and Bells on Temple Square, will be held December 8–10 in the Conference Center in Salt Lake City, Utah. Villazón will also join the Choir, Orchestra, and Bells for the Sunday broadcast of Music and the Spoken Word on December 11, which will not be ticketed. It’s early to talk about Christmas since fall has just arrived, but ticket distribution for the 2016 Christmas concerts by the Mormon Tabernacle Choir, Orchestra at Temple Square, and Bells on Temple Square is changing. This article provides readers advance notice of this change. So you didn’t score tickets to the event of the year—have no fear—because in upcoming weeks we’ll be giving away 20 pairs of tickets for the 2016 Christmas concerts with the Mormon Tabernacle Choir and Orchestra at Temple Square, with acclaimed tenor and entertainer Rolando Villazón. If you’re looking for the perfect Christmas album, this one has it all—Broadway star Laura Osnes beautifully singing Christmas favorites, the poignant narration of British screen actor Martin Jarvis, and guest soloists from the Metropolitan Opera. In 2001 Janice Kapp Perry received a request from the Music Department of The Church of Jesus Christ of Latter-day Saints to write a song for the first-ever Primary satellite broadcast, which would be held the following year. She was given a theme and suggested ideas of what she could include in her song. In her songwriting career, Perry has written over 1,000 songs, so we can only guess there wasn’t much doubt that she was up for the challenge. Next Mormon Tabernacle Choir Live Messiah in 2018! On Thursday and Friday, March 22 and 23, 2018 the Mormon Tabernacle Choir and Orchestra at Temple Square will once again present George Frideric Handel’s brilliant oratorio Messiah live in the Salt Lake Tabernacle. These performances, with world-class soloists, will be a special gift to people around the world as a prelude to Easter celebrations. The entire Messiah concert will be live streamed over the Internet on Friday, March 23, 2018, and will be available for on-demand viewing for the week following the concert on the Choir website and YouTube channel. A special guest from South Africa joined her voice with Mormon Tabernacle Choir members in their Thursday rehearsal before the October general conference of The Church of Jesus Christ of Latter-day Saints. Roma Thompson, a producer for the South African Broadcasting Corporation (SABC), practiced with the Choir many of the songs performed on Sunday’s Music and the Spoken Word broadcast. Tenebrae, English Chamber Choir, Joins Music and the Spoken Word on November 13! Musical guest for Music and the Spoken Word on Sunday, November 13, 2016, will be Tenebrae, the acclaimed London-based chamber choir. Described as “phenomenal” (The Times) and “devastatingly beautiful” (Gramophone Magazine), the award-winning ensemble has established itself as one of the most sought after chamber choirs in England and around the world. The group has the precision of a small chamber ensemble combined with the passion of a large cathedral choir to create a unique and enchanting sound, as effective in medieval music as it is in contemporary works. The timeless Primary song “He Sent His Son” was written by the prolific poet and songwriter Mabel Jones Gabbott (1910–2004) and Michael Moody. Gabbott (lyrics) and Moody (music) also cowrote many other Primary songs that are included in the current Children’s Songbook, such as “Sleep, Little Jesus,” “Who Is This Child?” “There Was Starlight on the Hillside,” and “Have a Very Merry Christmas.” The two also worked on the General Music Committee of The Church of Jesus Christ of Latter-day Saints. During the October 2014 general conference of The Church of Jesus Christ of Latter-day Saints, the Mormon Tabernacle Choir performed “If I Listen with My Heart,” by composer Sally DeFord. The arrangement sung was by the Choir’s associate director Ryan Murphy. Make Messiah a Part of Your Christmas! Today, almost 275 years since its premier performance, Handel’s beloved Messiah oratorio has become a favorite of both Christmas and Easter celebrations everywhere. Many will be surprised to learn that Messiah was not originally intended to be performed primarily as Christmas music. The first performance of Messiah took place in April, 1742 in Dublin and Easter-time performances continued during the decades that followed. Over the years, as the appreciation for Messiah spread, the number of Christmas season performances increased. The Salt Lake Tabernacle on Temple Square in Salt Lake City is a historical icon. The Tabernacle was completed in 1867 and is home to the Mormon Tabernacle Choir. It was named a historic civil engineering landmark by the American Society of Civil Engineers, alongside the Brooklyn Bridge, Hoover Dam, and the Boston subway. Get a behind the scenes look at what went into creating the Mormon Tabernacle Choir’s 2015 Christmas concert as you watch or listen to the latest episode of Mormon Tabernacle Choir Premieres. The audio version of this long-running series can be found on the Mormon Channel, while a video version is posted on the Choir’s YouTube Channel. The Mormon Tabernacle Choir’s new music video is full of references to the parables of Jesus found in Luke chapter 15. Watch the video and see how many references to Luke chapter 15 you can spot before looking at the answers below the video. The Mormon Tabernacle Choir’s new music video depicts the parable of the prodigal son and also references the parables of the lost sheep and the lost coin as told in Luke 15 of the New Testament. This modern-day retelling of the biblical story of the prodigal son depicts the love of God for all of His children and will serve as a reminder to be compassionate toward and accepting of those who seek forgiveness. “For this is my blood of the new testament, which is shed for many for the remission of sins. “But I say unto you, I will not drink henceforth of this fruit of the vine, until that day when I drink it new with you in my Father’s kingdom. Music is everywhere at Christmastime, especially when family, friends, church, and community groups gather. Christmas music is the soundtrack of the season as we celebrate our beliefs, hopes, and joys. “Music and the Spoken Word” Christmas Day Broadcast Finishes an Amazing Year! Jordan Smith’s “O Holy Night” Featuring the Mormon Tabernacle Choir Is Amazing! In 2015, Jordan Smith became the best-selling artist in the history of The Voice and won season 9. He sold 1.5 million singles in a six-month period and landed eight songs in the iTunes Top 10 chart, including three no. 1’s. Check out our updated Temple Square Organ webpages! The pipe organs of the Salt Lake Tabernacle and the Conference Center on Temple Square in Salt Lake City are two of the most recognized instruments in the world today. These organs are seen and heard on the Mormon Tabernacle Choir’s weekly television, radio, and Internet live-streamed broadcast of Music and the Spoken Word, annual public television Christmas specials, daily Temple Square recitals, along with numerous recordings, concerts, and conferences. Handel’s Messiah is a favorite at Christmas concerts and sing-ins. It’s not surprising then that the Mormon Tabernacle Choir—with a new recording of the full work coming out in spring 2016—is presenting a montage of Messiah music coupled with a reading about the work’s creation. Acclaimed British actor Martin Jarvis, knighted by Queen Elizabeth in the year 2000, presents the compelling story. What Would Handel Have Thought About the World’s Largest Virtual “Hallelujah” Chorus? In its first week, the world’s largest virtual “Hallelujah” chorus was viewed over 300,000 times on YouTube and over twice that on Facebook. The world is embracing the amazing collaboration between the Mormon Tabernacle Choir and singers around the globe. At the request of the U. S. Presidential Inauguration Committee, the Mormon Tabernacle Choir has accepted an invitation to sing at the swearing-in ceremony during the presidential inauguration at the U.S. Capitol next month in Washington, D.C. Thanks for making 2016 a great year! As we roll full steam ahead into 2017, let’s take a quick look back at some of the highlights of 2016. Luacine Clark Fox (1914–2002) is the composer of “Love One Another.” She was the daughter of J. Reuben Clark, who served in the First Presidency of The Church of Jesus Christ of Latter-day Saints from the 1930s to the 1960s. King’s Men, Organists Perform in the Tabernacle! The King’s Men, an a cappella ensemble comprised of 15 choral scholars from the Choir of King’s College, Cambridge, England, plus two organ scholars, also from King’s College, will present a special program on Thursday, March 30, 2017, at 12:00 noon in the Salt Lake Tabernacle on Temple Square. The King’s Men are members of the Chapel Choir at King’s College, which is currently touring in North America. The King’s Men function separately from the main choir, and the smaller ensemble is run entirely by the members of the group itself. They perform regularly around Britain and have performed in Australia, Hong Kong, and North America. The two organ scholars, Richard Gowers and Henry Websdale, who play for the services at King’s College, will each perform a solo number on the noon program. Former Choir member Erma Rosenhan recently celebrated her 102nd birthday by singing with the Mormon Tabernacle Choir during its Thursday night rehearsal in the Salt Lake Tabernacle. It had been 82 years since she joined the Choir in 1935 as a soprano. Erma’s mother Ida Rosenhan, who sang alto in the Choir for 10 years, was serving when Erma joined. During her time in the Choir, Erma traveled with the Choir on its first European tour in 1955. After singing for more than 20 years, Erma retired from the Choir in 1958. Mormon Tabernacle Choir & Friends CD: Five Ways to Learn More! This year marks the 150th anniversary of the Salt Lake Tabernacle organ. The then-newly constructed pipe organ made its debut in October 1867 during the first general conference of The Church of Jesus Christ of Latter-day Saints held in the Salt Lake Tabernacle. In the 150 years that have followed, the Tabernacle organ has served as the iconic backdrop for meetings and events broadcast throughout the world. The image of the Tabernacle organ itself has become widely known as a symbol of the Church and of the Mormon Tabernacle Choir. For over 40 years, the Mormon Tabernacle Choir has been performing the beloved songs of composer Richard Rodgers and lyricist and playwright Oscar Hammerstein II. Beginning in the 1940s and 1950s the team of Rodgers and Hammerstein changed the world of music and theater. Their popular Broadway musicals began what is now considered the “golden age” of musical theater. Their music today continues to give audiences around the world encouragement, hope, and comfort. A New Choice to Listen to Mormon Tabernacle Choir Music! How do you choose to listen to music? When the Mormon Tabernacle Choir made its first recording in 1910, there was only one way to listen to recorded music: with a gramophone, or later a phonograph. Lindsey Stirling has recorded hit albums, won prestigious awards, written a best-selling book, earned a spot on the Forbes Top-Earning YouTube Stars list and continues to inspire through her groundbreaking music videos. In 2013, Stirling spent some time as a guest artist for the Pioneer Day concerts with the Mormon Tabernacle Choir, performing her popular song “Elements,” among others. The Bells on Temple Square: Ringing in California! The Bells on Temple Square, part of the Mormon Tabernacle Choir organization, is touring again! The bell ensemble has played at various locations in Utah, and its first out-of-state performance was to Rexburg, Idaho, in 2015. This year the ensemble is traveling to Garden Grove, California, for the 2017 Handbell Musicians of America National Seminar. The group was selected to be the featured performer for the July 15 concluding concert, capping off the four-day seminar. LeAnna Willmore, conductor of the Bells on Temple Square, will direct the performance. The repertoire will explore a variety of musical genres from hymns, folk, and classical to jazz, gospel, and patriotic. The public is welcome to the performance in the Grand Ballroom of the Hyatt Regency Orange County on Saturday, July 15, at 6:00 p.m. For those able to attend the Southern California performance, tickets are available at the door for $15 or may be purchased online. Choir Broadcast Begins 89th Year! On July 16, 2017, the Mormon Tabernacle Choir began the 89th year of the weekly Music and the Spoken Word broadcast—the longest continuously running network broadcast in the history of radio. The King’s Singers are world famous for their crisp, harmonious vocals and their ability to entertain audiences. They have been repeat guests with the Mormon Tabernacle Choir and have performed songs such as “I’m Runnin’ On,” “Down to the River to Pray,” “The Dying Soldier,” “The Twelve Days of Christmas,” “O Holy Night,” “Angels from the Realms of Glory,” “Veni, Veni Emmanuel,” “God Rest Ye Merry, Gentlemen,” and many more throughout the years. How Does Lloyd Newell Come Up with His Spoken Word Messages? Last year, there were 52 episodes of Music and the Spoken Word—there will be 52 this year—and there will be 52 next year. This is the way it’s been since July 1929, when the beautiful sounds of the Mormon Tabernacle Choir coming from the historic Tabernacle on Temple Square began to be a familiar Sunday morning soundtrack to people around the world. The Mormon Tabernacle Choir lost a dear friend as Elder Robert D. Hales passed away in an area hospital on Sunday afternoon October 1 following the morning session of the 187th General Conference. Elder Hales had served as a General Authority since 1975. He was 85. The Bells on Temple Square celebrate the beginning of the holidays with “Prelude to the Season,” their annual concert on Friday and Saturday, November 17–18, 2017, at 7:30 p.m. in the Salt Lake Tabernacle on Temple Square. On November 17, 2017, a two-disc recording featuring the Mormon Tabernacle Choir and the Utah Symphony, directed by Thierry Fischer, will be released. The album also features choristers of The Madeleine Choir School and soloists Orla Boylan, Celena Shafer, and Amy Owens (sopranos); Charlotte Hellekant and Tamara Mumford (mezzo-sopranos); Barry Banks (tenor); Markus Werba (baritone); and Jordan Bisch (bass). Pre-orders are available on Amazon.com. Through November 16, purchases at the Utah Symphony Guild Store are $5 off. Celebrating Episode 4,600 of Music and the Spoken Word! On Sunday, November 12, 2017, the Mormon Tabernacle Choir celebrates broadcast number 4,600. The Choir’s weekly program, Music and the Spoken Word, is the world’s longest continuing network broadcast. Celebrate This Christmas Season With Messiah! 2017 - It's Been a Great Year! With the Sunday, December 31 New Year’s Eve broadcast of Music and the Spoken Word, the Mormon Tabernacle Choir will finish a busy, productive year. President Thomas S. Monson, sixteenth President of The Church of Jesus Christ of Latter-day Saints, died January 2, 2018, at age 90. 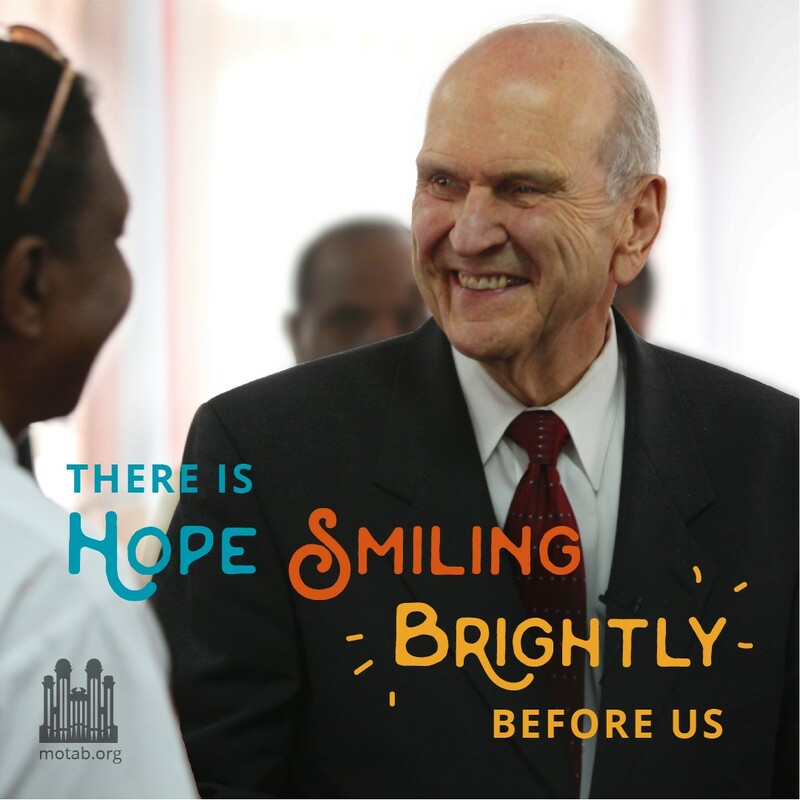 He had served as President since 2008, as a counselor in the First Presidency since 1985, and as an Apostle since 1963. He was no stranger to the Mormon Tabernacle Choir, and the entire Choir organization mourns his passing. Los Angeles Concert Announced for 2018 Tour! A new concert location has been announced—The Music Center’s Walt Disney Concert Hall in Los Angeles, California—for the Mormon Tabernacle Choir and Orchestra at Temple Square’s 2018 Classic Coast Tour this summer. The concert in Los Angeles on Wednesday, June 20 completes the list of seven locations where the Choir and Orchestra will perform. The 2018 Classic Coast Tour begins on Monday, June 18, and will conclude 16 days later on Tuesday, July 3, 2018, with visits to California, Washington, and Vancouver, Canada. For more than 35 years, Clay Christiansen has been a familiar face to fans of the Mormon Tabernacle Choir. In 1982, he was appointed as a Tabernacle organist, where he has become a familiar face to countless viewers of Music and the Spoken Word. Throughout the years he has recorded many Choir albums; performed in general conferences, Christmas concerts, and other special concerts; toured the world; and published compositions for chorus, string quartet, woodwind trio, and chamber and symphony orchestra. The poetic hymn “Jesus, Once of Humble Birth” was written by Parley P. Pratt, a member of the original Twelve Apostles of the Restoration. Pratt, who was nicknamed “the poet Apostle,” wrote the text for seven hymns that are included in the current hymnbook of The Church of Jesus Christ of Latter-day Saints.